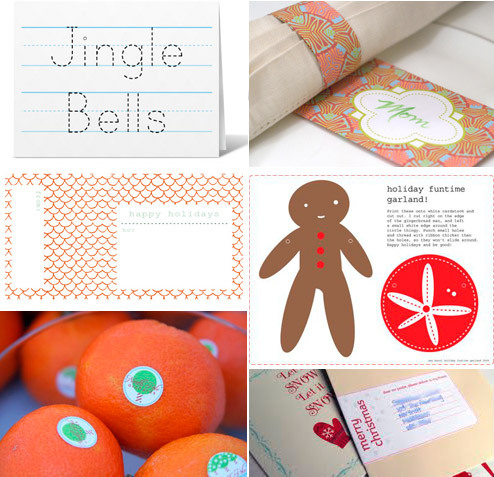 Are you ready for lots of lovely printable freebies that are perfect for the holiday season? I’ve got a little bit of everything for you, including plenty of gift tags, holiday cards and cards that you can print and give as gifts, party printables, and so many other printable pretties that have been generously created and shared by super talented gals and guys. First, I want to share with you a super cute printable postcard that Maddy from The Inspired Bride created as a holiday gift to me. 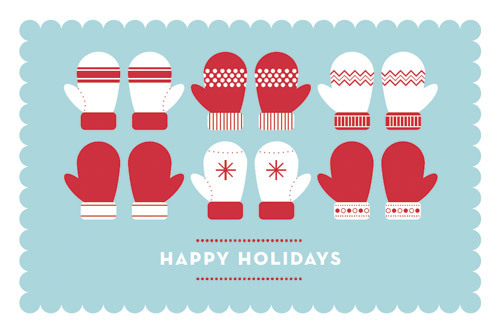 Icy blue, bright red, and mittens … does she know what I like, or what? I hope that you’ll enjoy it as much as I do. Download the postcard here. And, if you’re looking for more free printable gift tags than even a paper lover may know what to do with, then head over to Living Life as Art, where Francie has put together probably the most extensive list of free printable holiday tags that I’ve ever seen. * Neato old school notebook graphics from Cathe at Just Something I Made. Lots of project possibilities for this one! * Printable recipe cards by Vale Design, which look just like the old school, typed recipe cards in my mother’s and grandmother’s recipe boxes. Bourbon Chocolate Pecan Pie, Grandma’s Caponata, and Chili Cumin Cashew cards available … yum! 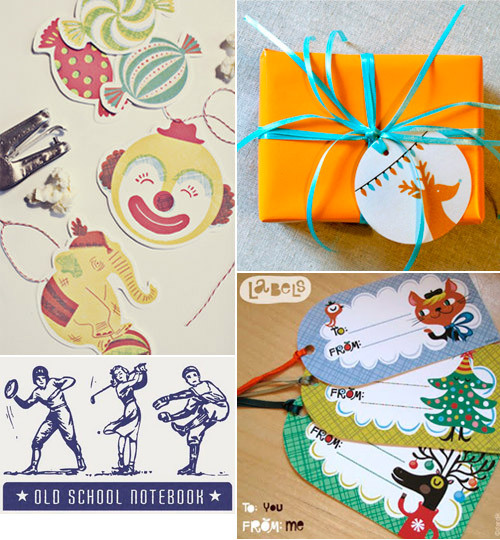 * Printable cards with awesome patterned envelopes by Cameron at Cottage Industrialist. Lots of lovely patterns to choose from! thanks for the link, and for so much other holiday fun! I can’t wait to use the old school notebook graphics. Oh thanks so much for sharing my holiday gift tags with everyone. I’m honored to be in such good company with so many talented people. Happy Holidays! GREAT list of links!! thank you so much! It was my pleasure, ladies! Thanks for generously sharing your lovely creations! thank you for making my holidays a little less stressful!!! Adorable freebies!!! Thanks so much for featuring my printables–I love to see the incredible variety of styles and clever ideas, and I have already picked out a couple that I’ll be printing! The labels are great, but are there any out there who use templates that work with say avery or staples brand labels? That’s a lot easier than printing and cutting them all out! Glad to be of help, amy! Cameron, thank you for being so generous. 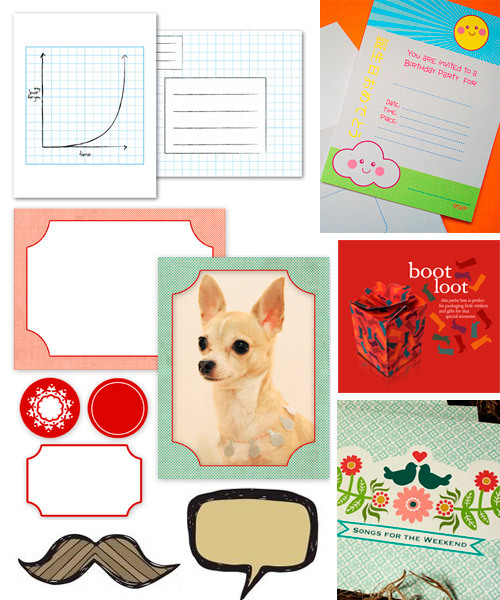 Love the geek printables, and I can’t get over how many awesome patterns you shared on the mini cards/envelopes! 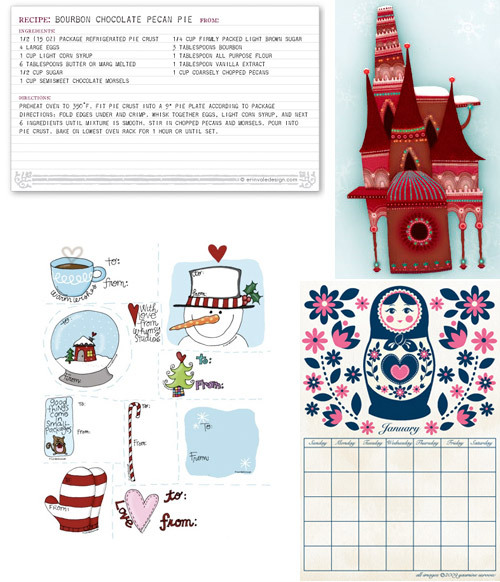 Nikki – I don’t come across many printables that are set up for avery type labels. I can’t speak for anyone else, but I know that I usually have to make a lot of adjustments when I’m using templates for sheets of labels so they’ll line up properly, and I know that paper is fed differently in every printer, so a template that works on one printer may not work on another. That’s why I go freeform when I design labels. Francie – Thank YOU for putting together such a fantastic list!